As the RAV4 continues to corner the market on compact sport utility vans geared toward young adventurers, 2016 brings a multitude of upgrades to the inside, the outside as well as the powertrain. To start with, the 2016 Toyota RAV4 sports a higher hoodline, simulated skid plates and dramatic new headlights. Also new for 2016 is a more athletic suspension that makes a big difference in the quality of the RAV4 ride. There is only one way to find out how versatile and perky the new RAV4 is. Drop by Toyota of Longview for a thrilling test drive, and a look at all the different RAV4 trim levels and accessories. Serving the Tyler, Kilgore, Marshall, Carthage, TX areas, we pride ourselves on exemplary customer service and attention to detail. Our spacious showroom at 14 W Loop 281 in Longview, TX, is brimming with 2016 RAV4s, and we are certain you will find one that strikes your fancy. Our knowledgeable and friendly staff can help you drive off in the sport utility vehicle of your dreams, with a sweet deal on a RAV4 that fits your lifestyle like a glove. 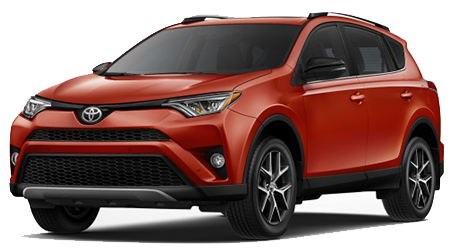 The 2016 RAV4 will enchant you with a bold new look and matching wheels. On the RAV4 LE, you get 17-inch wheels with dynamic vented spokes; the RAV4 Limited has 18-inch high-gloss chrome alloy wheels; and the XLE comes with very shiny 17-inch alloy wheels. And then there is the RAV4 SE. Get ready for the breathtaking RAV4 SE because it’s ready for you. Besides the stylish hoodline and new headlights, the SE brings it, with a dramatic honeycomb grille insert, 18-inch special edition wheels, and piercing LED projector-beam headlights. New for 2016 is an intriguing simulated front skid plate on the SE package that peeks from under the hood. While the head-turning Daytime Running Lights are not new, they are framed this year with an awesome silver-painted bumper garnish that stands out a mile away. The new Toyota RAV4 is a looker! It makes no difference whether you are headed across town or across the country, the RAV4’s aggressive 2.5L four-cylinder engine and robust six-speed automatic provide more than enough power to get you to your destination ahead of time. You will definitely take note of the smooth-sailing front-wheel-drive and precise steering, and you will find that the perky RAV4 makes driving fun again. Did you know that RAV4’s unusual name is an acronym for “Recreational Active Vehicle with 4-wheel drive”? But not all Toyota RAV4s are all-wheel-drive vehicles. If you step up to the AWD option, you get rewarded with an incredible All-Wheel-Drive system and Dynamic Torque Control that channels more power to the wheels with the most traction. The 2016 RAV4 boasts stiffer springs, bigger anti-roll bars and improved damping. Critics are impressed with the all-new suspension, claiming it handles bumps and curves solidly. On the road or off, the new RAV4 hits all the right notes. The 2016 RAV4 is a lot more comfortable inside this year, with the addition of premium seats that are soft to the touch but firm on your spine. You will appreciate the anti-fatigue support on longer trips. Instead of feeling cranky and crampy after a long trip, you will be invigorated and refreshed. It seats five very comfortably, with enough legroom and headroom to let everyone stretch out. Even technophiles will be impressed with the RAV4’s up-to-date apps and connectivity. All RAV4s come standard Bluetooth, a rearview camera and crisp 6.1-inch touch screen, and a 2.0 USB port. You can upgrade to a power moonroof, an awesome 11-speaker premium JBL audio system premium speakers, front and rear parking sensors, dual-zone automatic climate controls, a 360-degree camera and an upgraded infotainment system with a 7-inch touch screen. For the ultimate in driver convenience, you can customize the infotainment commands for GPS real-time navigation, satellite radio, HD radio and Siri Eyes Free. If there is a high-tech amenity not available in the new Toyota RAV4, you don’t need it. If you live near Tyler, Kilgore, Marshall or Carthage, TX, you owe it to yourself to visit Toyota of Longview for a first-hand look at the dynamic new RAV4. We are easy to find at 14 W Loop 281 in Longview, TX, and there are some excellent roads around here to put the 2016 Toyota RAV4 through its paces. Stop by soon!